While pregnancy in humans and seed development in plants look very different, parallels exist – not least that the embryo develops in close connection with the mother. In animals, a whole network of signals from the mother is known to influence embryo development. 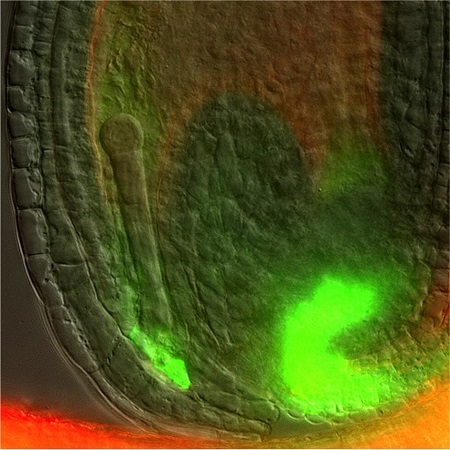 In plants, it has been clear for a while that maternal signals regulate embryo development. However, the signal itself was unknown – until now. Plant scientists at the Institute of Science and Technology Austria (IST Austria), Central European Institute of Technology (CEITEC) and the University of Freiburg have now found that a plant hormone, called auxin, from the mother is one of the signals that pattern the plant embryo. Their study is published today in Nature Plants. “Plant scientists have been trying to figure out the nature of the signal between mother and embryo for decades”, explains Jiri Friml, Professor at IST Austria and one of the corresponding authors. “We show that the mother is the source of auxin which regulates early embryo development.” Auxin is a hormone that plays many roles in the development of plants, and has been known to regulate embryo development. By visualizing the biosynthesis of and the response to auxin, the researchers show that the maternal tissue which surrounds the embryo in the seed starts to produce more auxin after fertilization. The authors then go on to show that this increased maternal auxin production is crucial for the embryo: when auxin production is interrupted, the embryo does not develop correctly. And it is specifically maternal auxin that plays this important role. When the researchers set up a cross between plants so that the mother does not produce auxin but the embryo does, the same defects in embryo development are seen – proving that auxin from the mother is the key developmental signal. However, auxin is not the only maternal signal influencing the embryo, Friml explains: “When we stop the supply of auxin from the mother to the embryo, the embryo grows abnormally, but it still manages to develop somehow. This means that there must be another, auxin-independent, signal.” The paper is a collaboration between Jiri Friml and his group, notably Helene S. Robert, a previous Post-doc of Friml and now group leader at CEITEC in Brno, and the group of Thomas Laux at the University of Freiburg.